Claudine's fans were concerned with the instagram photo that Claudine Barreto uploaded on social network Instagram earlier today, June 21, 2013. Claudine's daughter Sabina turned nine(9) years old today. 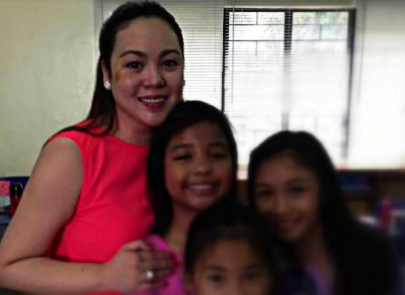 Claudine uploaded a photo with daughter Sabina and two unidentified little girls who attended Sabina's birthday party. In this photo, the black eye and bruises on her right cheek are very obvious. I think ( I may be wrong ) her right cheek is a little bit bloated. What exactly happened to Claudine Barreto? This instagram photo were deleted by Claudine when her fans began asking her why she had those bruises.